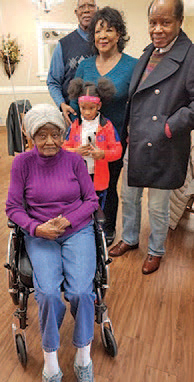 Ireland (seated) shares a moment with Destiny Ireland (Great Granddaughter); (L-R) William Ireland (son), Margie Ireland (daughter-in-law) and Harold Ireland (son). Christine Adams Ireland celebrated her 111th birthday on January 19, 2019. And she just may be the oldest living person in North Carolina, and possibly the country, according to N.C. NAACP President, Rev. T. Anthony Spearman. “It’s significant for anyone to reach the age of 100, and to exceed it by 11 years is very significant. I thought it be appropriate to do as much as I could to let people know that we have someone her age in our midst,” said Spearman, who is working on getting that fact certified through the N.C. Governor’s Office. Ireland has witnessed a multitude of things in her lifetime. In 111 years, she has lived through the Great Depression, segregation, the Civil Rights Movement, WWI and II, and the Vietnam War. She was able to see a lot of firsts for African Americans, including the election of the first Black president. “She’s a walking history book. I think that folks can draw from that,” said Spearman, who is also Ireland’s first cousin, once removed. Ireland received a State issued birthday commemoration, delivered by N.C. Gov. Roy Cooper, as well as a City of Greensboro resolution signed by Mayor Nancy Vaughan and District 1 Council member Sharon Hightower, acknowledging Ireland’s birthday. Ireland was born January 19, 1908, the oldest of eight children. In 1908, a Republican from New York named Theodore Roosevelt was President of the United States, there were only 46 stars on the American Flag, and the first upright vacuum cleaner was invented. Ireland’s parents raised her and her siblings on a farm in Cumberland County, surrounded by apple and peach trees, and raised hogs and chickens. Her son, Harold, who resides in Sedalia, N.C., recalls a story from his grandmother, that his grandfather listed his race as White on land documents in order to protect his assets, because for a Black man to own so much land during the 1860s was unheard of. “A group of White men could come together and tell the courts that you owed them money, and they could take your land. It was a different time,” he said. Harold added that his mother was a great cook. She learned how to cook when she was seven years old, and would stand on a wooden box in front of the stove to help prepare dinner. Ireland attended high school at a Immanu Lutheran High School in Greensboro, and became a teacher in 1931. She married William Ireland in 1932 and they settled in Greensboro where they raised three boys and three girls. Her husband provided for the family through his job on the railroad and Ireland took the lead in running the household and educating her children. Two of her daughters, Yvonne and Marcela, went on to attend Bennett College and also became teachers. Ireland now resides at Alamance House, a nursing facility in Burlington. She has a younger sister who is 95 years old and resides in Fayetteville.